Porada International Design Award 2018, the 7th edition of the international competition, this year is focused on different types of writing desks and dressing tables. The challenge is to interpret the values and identity of Porada, leading brand of Italian design, through the creation of innovative concepts for different types of writing desks and dressing tables, in which the use of solid wood is prevalent (but not necessarily exclusive). A total prize money of 10,000 Euro will be shared between three winners in each of the Professional and Student categories. The winning projects of the competition will also be prototyped and possibly produced by Porada. Projects relating to the 2018 edition must be original and unpublished; they must enhance the use of production technologies and woodworking processes and typical finishing of the solid wood. The projects should also comply with specific functionality, with the current safety standards, with ergonomic characteristics, with both environmental and sustainable design characteristics. Wood, whether in natural-finish, preferably in finishes prevalently used by the company, or painted, can be combined with metal, mirrors, crystals, leather, hides or fabric. Promoted by Porada Arredi srl, a leading company in the production of furnishing accessories, and POLI.design, under the patronage of ADI, the Association for Industrial Design, the competition is open to designers and creative people (individuals or groups), professionals or non-professionals, corporate employees and students. Innovation, originality and search for new design solutions for woodworking processes — those are the guidelines of the challenge. 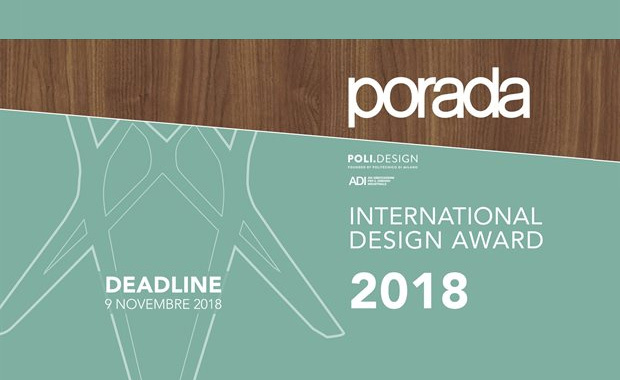 For more details on how to participate or to submit an application, designers and creative professionals, both Italian and foreign should consult the announcement on the site www.porada.it, www.polidesign.net and www.porada-design-award.polidesign.net.